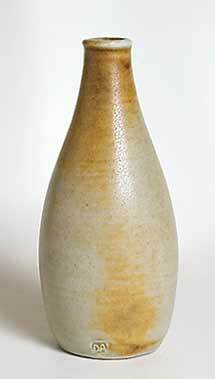 Arbeid bottle - 6½" (165 mm) high. Dan Arbeid was born in London in 1928. He left school in 1942 and worked as a tailor for thirteen years. In 1955 he went to Israel to live on a kibbutz, and a year later went to work in a ceramics factory in Beersheba. He returned to London in 1957 and became a technical assistant at the Central School of Art. He set up his own studio in Hertfordshire, and started to exhibit his work. Arbeid's pots did not follow convention; they could not be likened to any of the styles that were current in the 1950s, and it can fairly be said that he was the originator of new school in ceramic design. In 1963 he moved to Essex and started a new studio near Saffron Walden. He became a lecturer at the Central School of Art, and later a senior lecturer. He also taught at Camberwell and visited other schools of art giving lectures and demonstrations. It is often said that he devoted too much time to teaching at the expense of production of his own work. He moved to Brighton, Sussex, in 1983 and worked there until his retirement in 1988. His methods were diverse, encompassing many techniques. Some work is thrown, some hand-built, some coiled. He loved to experiment, and has earned a place as a post-war pioneer of British ceramics.